The Tex Files - Home of Arianne 'Tex' Thompson: Guest Post: "Snapshots" with Patricia Lynne! 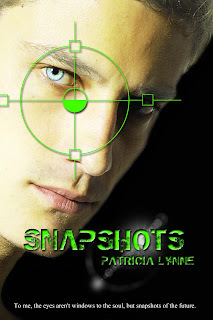 Guest Post: "Snapshots" with Patricia Lynne! Hey guys! I'm sorry it's been such a godawful-long time since I did anything around here. That is about to change with a quickness (with a *fierceness*!) But as I hop a plane for sunny Santa Monica (and then super Seattle, and then perfect Portland! ), my good buddy Patricia Lynne is here to help us out in the meantime. "Patricia SCHOOLS YOU," say I. Well. Maybe not you - you seem pretty on top of things - but listen up: aspiring writers, you need to follow this lady. She is without a doubt one of the most organized, friendly, relentlessly productive and enthusiastic e-people I know. If I'm the neighbor with grass growing only out of the broken toilet in my front yard, she's the one showing up to your front door with a pan of brownies and an invitation to join the local roller derby. And it's my privilege to heft myself out of my beer-stained lawn chair to help her celebrate the re-birthday of her second novel, Snapshots. Take it away, P-Lynne! I had a problem when it came time to publish Snapshots. What genre did I put it in? Unlike Being Human, the story didn’t fit easily into one genre. It has little bits of genres here and there. Finally, I had a friend suggest Speculative Fiction. Patricia Lynne never set out to become a writer. In fact, she never considered it an option during high school and college. She was more of an art and band geek. Some stories are meant to be told and now she can't stop writing. Patricia lives with her husband in Michigan, hopes one day to have what will resemble a small petting zoo and has a fondness for dying her hair the colors of the rainbow. Anyway, just popping by from the Snapshots Birthday Party. I love your descriptiong of Patricia Lynne as being organized and prolific. She is impressive! YES she is! She makes me wish I were Borg, so I could add her creative and organizational distinctiveness to my own. Glad you are part of the party, by the way - so many awesome people on Team Birthday! Tui, no worries because I write Paranormal too. Snapshots is just Sci-Fi-ish. Haha, Snapshots is definitely not paranormal. Spec fic fits it very well, genre-wise.